West Texas A&M opened a simulated emergency operations center on campus to train student teachers on how to respond to crises, including active shooters and natural disasters. CANYON — In a college classroom in the Texas Panhandle this fall, student teachers will study more than how to plan lessons or manage a classroom. They'll learn what to do when a gunman attacks their school. The Crisis Management Classroom will train student teachers at West Texas A&M University to handle emergencies including tornadoes and active shooters. Though the school has been preparing teachers and administrators for school violence since 2001, the new classroom — which was unveiled this week — will amp up training with new technology normally reserved for emergency responders. The unveiling comes a month after a deadly shooting at Santa Fe High School southeast of Houston. The Canyon classroom, however, has been in the works since 2015. Eddie Henderson, dean of the West Texas A&M College of Education and Social Sciences, said the new classroom was designed keeping in mind the “real crises facing our schools and communities” today. Those crises now include shootings. On a recent Friday afternoon, West Texas A&M criminal justice professor Harry Hueston demonstrated the features of the classroom, declaring “there’s nothing else like this in the country.” On large computer screens hovering over blank tables, maps of the city showed simulated emergencies and chatrooms flowed with hurried conversations of emergency responders. Student teachers and students studying emergency management will sit at the tables depending on what role they'll play — firefighters, police, school administrators, medical personnel — and react to crises as they play out on large screens like at a municipal emergency operations center, deciding what to do in real time. Do they evacuate the school? Who do they contact? Where are the students? Afterward, they can compare how they reacted with the real actions of educators and emergency responders. West Texas A&M is not the first public university in the state to train for active shooters. Texas State University operates the Advanced Law Enforcement Rapid Response Training Center, also known as ALERRT, which offers the FBI certified standard of training for active shooter situations. ALERRT, however, trains law enforcement officials who can share those practices with their communities, said Pete Blair, the center's executive director. West Texas A&M's program focuses specifically on training educators. Across the country, local police departments often prepare schools to respond to active shooter situations. Many other schools employ private companies such as the ALICE Training Institute to train educators. Noel Candelaria, president of the Texas State Teachers Association and a former special education teacher, said programs like the one at West Texas A&M are positive steps toward preventing school violence and are much more productive than controversial measures like arming teachers. "These are all smart small pieces trying to solve a much bigger problem," Candelaria said. "But in the meantime we must not lose sight that we still are responsible to develop and raise children to interact with each other. " In Canyon, the majority of emergencies the classroom will address are not shootings but the many natural disasters common to the area, Henderson said, including tornadoes, fires and blizzards. But preparing student teachers for school shooters has long been a priority. West Texas A&M has already offered active shooter training programs to its student teachers and to educators in the region. One program, "When Seconds Count," simulates an active shooter situation through video, prompting student teachers to decide what to do in a variety of shooter situations. The new classroom uses software called Veoci, which allows coordination between city services, school districts and emergency responders during a crisis. Canyon, the city where the university is located, and neighboring Amarillo already use Veoci for their emergency response infrastructure. 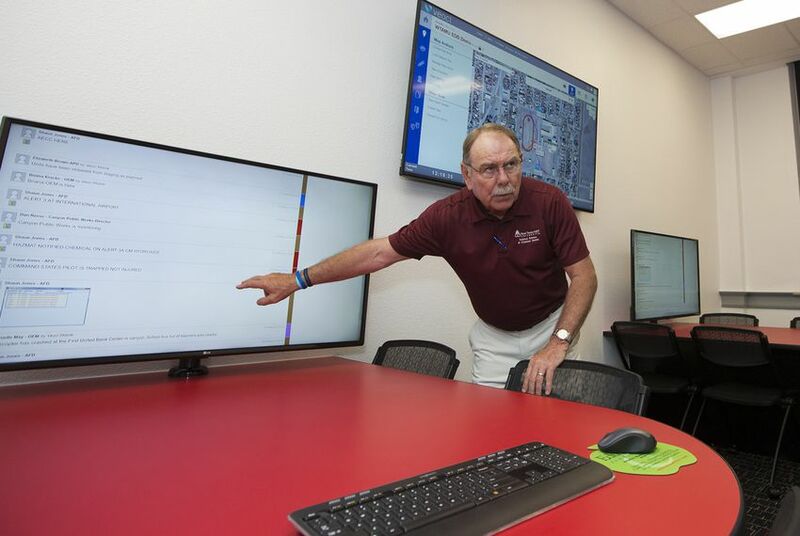 Chip Orton, director of emergency management for Amarillo, introduced the software to criminal justice professor Harry Hueston in 2015, and Hueston has been developing the classroom ever since. Orton said he hopes that administrators who train with Veoci will integrate the software into their school systems after using the classroom. Already, Amarillo Independent School District used Veoci during an incident in February. After a student Snapchatted an image with a gun and threatened to attack a local school, school officials communicated with each other on Veoci, sharing the image and discussing how to respond. Orton saw the exchanges among administrators and jumped in, offering emergency services to help. The post turned out to be a fake threat, but the incident demonstrated the ease in coordination the software offers, Orton said. Orton said that when he first started his job, "even though we knew ISDs, we didn’t really interact with them much, and that’s one thing that I wanted to change. And I think it’s almost necessary by default now." Paul Bourquin, school safety coordinator at Amarillo Independent School District, said the amplified coordination with local emergency responders allowed better response times. Prior to his current role in the school district, Bourquin had 23 years of law enforcement experience. It’s more important for teachers to understand emergency procedures since he first started working as school violence becomes a greater threat, he said. Hueston and Henderson said they do not take a position on whether to arm teachers, saying that their programs focus on training teachers whatever the circumstances of their school district. Though it's important to educate teachers on how to handle an active shooter situation, Hueston said it's just as important to teach ways to prevent school violence and how to follow up on a shooting. Hueston, a former police chief at the University of Arizona, said he has seen the effects of PTSD firsthand and integrated psychological training for teachers into the curriculum. In rural regions without designated counselors, it's vital to train administrators and faculty in how to recover from a shooting situation, Hueston said. About 25 percent of Texas school districts are rural — a figure that jumps to 75 percent in the Panhandle, Henderson said. Even students who have taken part in the "When Seconds Count" program have shown signs of shock and emotional distress, Hueston said, emphasizing the importance of emotional follow-up when a real shooting occurs. "Santa Fe, that school from a mental standpoint is going to take anywhere from nine [months] to decades to recover," Hueston said. "Because you never really get over an incident like that." The Texas State Teachers Association has been a financial supporter of The Texas Tribune, a nonprofit, nonpartisan news organization that is funded in part by donations from members, foundations and corporate sponsors. Financial supporters play no role in the Tribune's journalism. Find a complete list of them here. This Texas school began arming teachers with guns in 2007. More than 170 other districts have followed.